It’s the perfect combination for a Winter Wonderland getaway: A world-class beer festival at a world-class ski resort! There are discounted ski/snowboard rentals available, discounted lodging, and other arrangements made for Big Beers Festival attendees. Almost all of the Sixteenth Anniversary weekend will be held at the Vail Cascade Resort & Spa, and the Small Plates & Craft Beer Pairing will be held at Terra Bistro in the Vail Mountain Lodge. From Thursday at 2pm through close of the Fireside on Saturday night, Craft Beer & Brewing Magazine will be sponsoring Happy Hour in Fireside Bar and Atwater on Gore Creek in the Vail Cascade Resort. Draft beers will be $1 off for the duration of the Big Beers, Belgians & Barleywines Festival! This is our opportunity to thank all of the breweries and importers who make this weekend possible. Our second annual Brewers Reception will be held in the Vail Cascade Resort with much fun and camaraderie. BSG Craft Brewing is sponsoring the event, and we thank the brewers for donating libations for the festivities. This is a closed event; brewers and importers only. The Sixteenth Anniversary Big Beers Festival Weekend opens in traditional Big Beers style! Enjoy a double beer pairing dinner with fantastic creations from both Avery and Dogfish Head at each course. 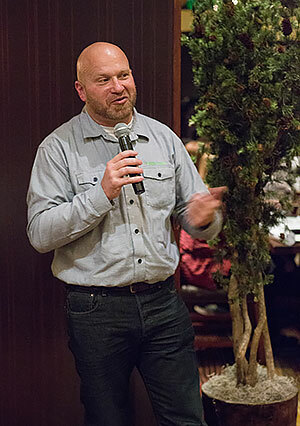 This year, Adam Avery will be hosting the Calibration Dinner with Tim Hawn, Brewmaster for Dogfish Head, and the Vail Cascade culinary team. See the Calibration Dinner page for further information. This is the opportunity to bone up on your knowledge of everything about beer & brewing at our Cicerone Workshop. Ray Daniels, creator of the Cicerone Program will be here to lead this morning workshop! And thanks to All About Beer Magazine, our signature sponsor for this event, the $99 fee per person will be waived. Take advantage of this unprecedented opportunity in Vail! For more information, see the Seminars page. The first session for the American Homebrewers Association-sanctioned Belgians, Barleywines and Strong Ales Homebrew Competition. This event is a judging by a select judging panel for entries registered in advance. For more information about the competition, see the Homebrew Competition page. Spectators and interested parties are welcome to attend, although participation is by prior arrangement only. We thank Brew Your Own Magazine for their sponsorship of the Big Beers Homebrew Competition. Our Welcome Reception in which the following breweries will be highlighted: The Bruery, Deschutes Brewing Co., and Strange Craft Beer Company. 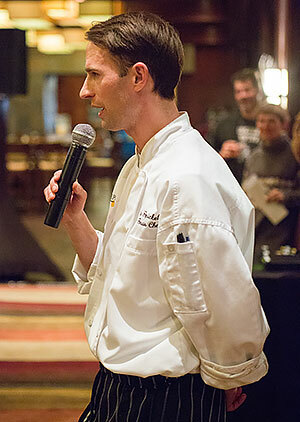 Each brewery will be showcasing a beer of their choice with a food pairing designed by Exec Chef Chris Bates and his culinary team at the Vail Cascade Resort & Spa. In addition to tasting, the Welcome Reception also offers the opportunity to hobnob with some of the most innovative brewers in the world. Guests attending multiple weekend events, Volunteers, Judges, Brewers and Brewery Representatives are welcome to drop in. We thank YCH Hops for their support of this event! The second session for the American Homebrewers Association-sanctioned Belgians, Barleywines and Strong Ales Homebrew Competition. This event is a judging by a select judging panel for entries registered in advance. For more information about the competition, see the Homebrew Competition page. Spectators and interested parties are welcome to attend, although participation is by prior arrangement only. We thank Brew Your Own Magazine for their sponsorship of the Big Beers Homebrew Competition. A highly interactive and educational workshop with Ginger Johnson of Women Enjoying Beer and Ginger Johnson, LLC. Attend to learn the Why Behind The Buy for women. Register and/or find out more at WomenEnjoyingBeer.com and GingerJohnson.com. For more information, see the Seminars page. Our new Small Plates & Craft Beer Pairing event will be held off-site at Terra Bistro. The two Brewmasters/Owner teams featured for this dinner will be Paul & Kim Kavulak of Nebraska Brewing Co. and Phil & Emily Wymore of Perennial Artisan Ales. 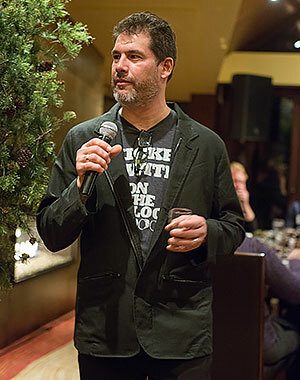 John Holl, Editor of All About Beer Magazine, will be your Master of Ceremonies. See the Small Plates Pairing page for further information. The Big Beers, Belgians & Barleywines Traditional Brewmasters’ Dinner highlighting our 2016 Featured Brewmasters, Geoff Larson, President/Co-Founder of Alaskan Brewing & Bottling Co., and Omar Ansari, Owner of Surly Brewing Co. Join us for a second evening of double beer pairing fun! See the Brewmasters’ Dinner page for further information. Cigar Pairing Experience – Join us for cigars and great craft beer with Paul Gatza of the Brewers Association and Greg & Bridgette Geiger. Experiment with various pairings and visit with Clay Carlson of Palma Cigars and your hosts behind the featured pairings. No ticket required for this event, and no formal presentation. Come and go as you like. Bring a jacket for smoking cigars outside. See the Seminars page for further information. One of the many highlights of our Big Beers Festival Weekend: our Experimental Brewing Seminar, titled “Brewing Outside of the Box: Brewers Gone Wild!” The topic for this year’s seminar is “Koelschips”. Presenters are Jason Perkins of Allagash Brewing Co., Jason Yester of Trinity Brewing Co., Jeffrey Stuffings of Jester King Brewery, and Chase Healey of Prairie Artisan Ales. The Barrel in Estes Park and Mueller & Associates CPA are Co-Sponsors of this crazy panel, and David Edgar will lead the charge and try to keep them under control. See the Seminars page for further information. The Yoga of Brewing: Discover yogic wisdom and practices to enhance your skill as both a brewer and a consumer of amazing beer. This session is the perfect way to prepare your body, mind, and soul to receive the outstanding selection of beers coming your way throughout the day. Join Rachel Ponce of Bend Yoga & Movement Studio in Chicago and her husband, Eric Ponce, of Goose Island Beer Co. for this experiential session. No yoga experience, mat, or yoga pants required! Roll out of bed for your first – and most unique – pairing of the day. No ticket required for this event. See the Seminars page for further information. 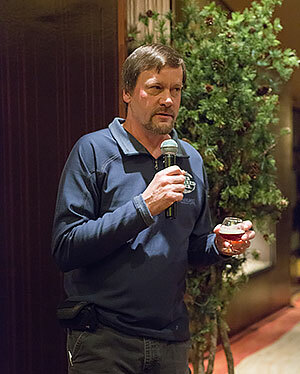 Brewmasters Seminar Track: Geoff Larson of Alaskan Brewing Co. will be speaking about “How Local Ingredients and a Remote Location Have Pushed Brewing Innovation at Alaskan.” See the Seminars page for further information. Technical Seminar Track: Troy Casey of Casey Blending & Brewing will be speaking on “Check The Blend: Tasting a Blend of The Cut from Start to Finish.” See the Seminars page for further information. Sensory Workshop Track: “Miracles From Mistakes.” Moderated by John Holl of All About Beer Magazine, learn tips and techniques to make better beer, learn from mistakes, and get some insight into the challenging and ultimately rewarding profession of brewing beer. See the Seminars page for further information. Random Track: “Experimental Homebrewing – Mad Science in the Pursuit of Great Beer.” Join Denny Conn & Drew Beechum for homebrewing wizardry. More details to come. See the Seminars page for further information. Brewmasters Seminar Track: Omar Ansari, Owner of Surly Brewing Co. will be speaking on “Shades of Darkness.” See the Seminars page for further information. Technical Seminar Track: Learn about “Sourcing Barrels” with Noah Steingraeber of Rocky Mountain Barrel Company and a panel of barrel specialists from various breweries. See the Seminars page for further information. Sensory Workshop Track: Join us for “How to Cook With Beer: Wandering Around Your Kitchen With Ginger” with Ginger Johnson of Women Enjoying Beer. More details to come. See the Seminars page for further information. Random Track: “Build Your Beer IQ: The Science Behind Flavor” with Dr. Nicole Garneau of Flavor Lab, LLC. See the Seminars page for further information. 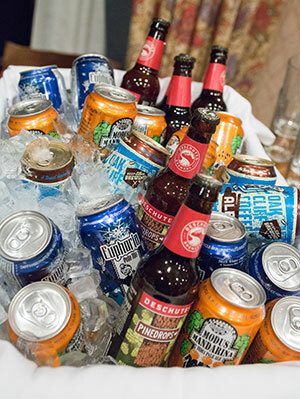 The Commercial Tasting portion of the Big Beers Festival begins at 2:30 pm and continues through until 6:00pm. This international tasting is open to the public and showcases over 300 different commercially produced specialty beers from around the world. The Vail Ale House will be hosting an evening sponsored by Draft Magazine to benefit the Vail Valley Charitable Fund in coordination with the Big Beers Festival. Transportation will be provided from the Vail Cascade lobby to the Vail Ale House in West Vail and back until 1:00am. For further information about promotions and the bands that will be playing, see VailAleHouse.com and check out the calendar of events.